Clicklink is a cost-effective sortation and delivery service which guarantees the delivery of orders placed by 9pm to your store, for customer collection before noon the next day. Remember when customers just walked into a store, bought what they wanted and took it home? It was a simpler world. Your main priority was getting stock onto the shelves. But then, the internet came along and virtually overnight, a tsunami of new orders came flooding in. Retail logistics operations have been faced with challenges ever since, with many companies forced to make a daily choice between replenishing stores or delivering their Next Day promise, with an over reliance on third party service providers. And all too often, that’s meant letting customers down. Which is more than a shame. It’s a brand disaster. Because, in our ultra-competitive world, customers demand service options on their terms. Online. In store. Same day. Next day. And always in pristine condition. No excuses. Customers are turning to Click & Collect in their droves. Remarkably, over half of UK adults used Click & Collect in the last 12 months*. And many retailers have started competing on delivery choices, because for customers, convenience trumps speed – and ‘where’ is as important as ‘when’. 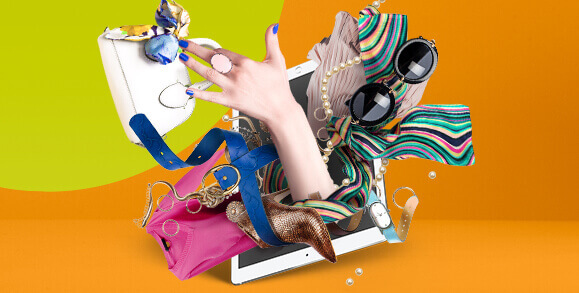 matter of days, Clicklink can grow with your business and adapt to your evolving retail needs. It can even be integrated with BoomerangTM, our powerful returns solution, to create a closed loop solution. * Source: JDA & Centrino Customer Pulse Report UK 2016. Our best-in-class service allows you to offer Next Day delivery with ease. Plus, our front of house transactional PUDO and back of house WMS, means you can trust Clicklink to keep everything running smoothly even during peak retail moments throughout the year. 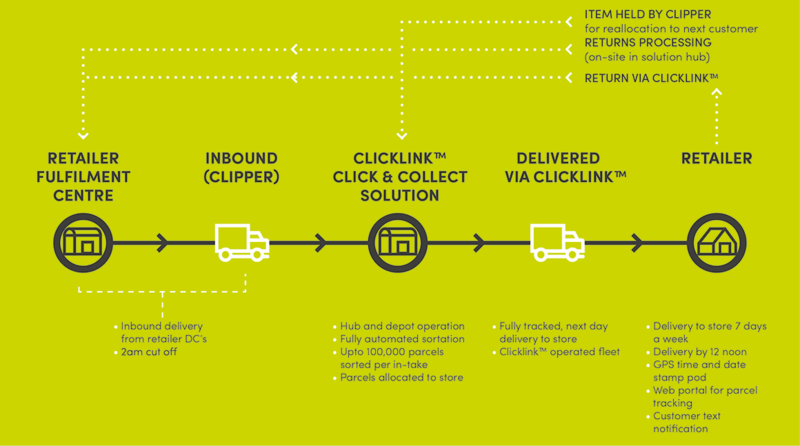 Clicklink tracks outbound Next Day delivery parcels from receipt to store delivery (and back again via BoomerangTM). At the Clicklink hub, overhead sorter scanners and wrist devices track packages onto delivery vehicles. Then at the final leg of their journey, handheld GPS terminals create a signed-for proof of delivery. You can track every single parcel and monitor each delivery against agreed SLAs – virtually in real-time using our Clicklink web portal. The portal can be uploaded to your website, so your customers can monitor their own parcels any time they choose. Delivery information, possible delays and return payments can even be sent to your customers as text messages. All returned goods are scanned into secure cages, collected daily, tracked through the Clicklink network and BoomerangTM Returns Centre. In-demand items are fast-tracked to re-pack fulfilment stations, before delivery next day, to either yours or a Clicklink-managed Click & Collect network. This bypasses expensive and time-consuming stock movements and warehouse replenishment systems. Clicklink complements your legacy delivery services and provides complete end-to-end integration with full parcel tracking through every link of the supply chain. Clicklink uses the latest fully integrated online and in-store systems to future-proof the service and protect your investment. Guaranteed by noon on all orders placed before 9pm the evening before, 7 days a week, to help you to excel in the retail marketplace. Clicklink guarantees you keep your service promises. Highly flexible, Clicklink can scale up at a moment’s notice to safeguard your customer service levels and support your forecast growth curve. Clicklink gives assured service level volumes for peace of mind, 365 days a year. Keep control over every facet of your network to ensure supply chain integrity. Clicklink provides secure caged deliveries for precision storing and best use of space. With minimum capital outlay, proven reliability and a rapid return on investment, Clicklink makes perfect business sense. Discover more about our returns solution, BoomerangTM. Download the ClicklinkTM brochure here.